The Duke and Duchess of Cambridge are touring India and Bhutan and, as with any major royal tour, there’s a major royal tour wardrobe to behold, as Duchess Kate has brought a case full of designer outfit options to show us. Kicking things off, it’s a trusted brand in Kate’s style arson who she’s briefed to create something special and suitable – Alexander McQueen. Adapted from designer Sarah Burton’s pre-fall collection, Kate wore this richly decorated peplum dress when she attended a wreath laying ceremony at The Taj Hotel in Mumbai. 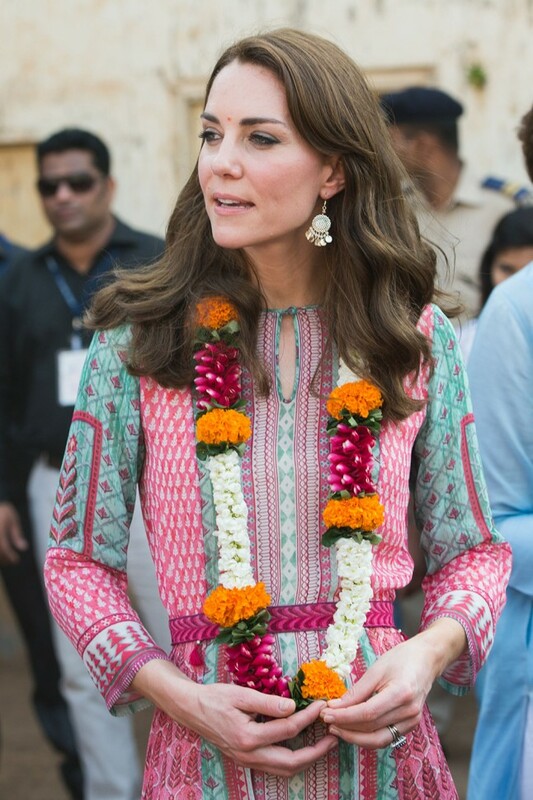 Kate’s mastered the art of dressing diplomatically over the years and, showing total consideration for her host country, the print nods to the textile traditions of both Britain and India. Fashion fact; the paisley originates from India’s Kashmir region in the 11th century but first came to the UK in the 1700s. After the official ceremonies were over, Kate switched into something a little less formal for a cricket match and a tour of some of Mumbai’s slum areas. She chose a printed ‘Gulrukh’ dress by Mumbai-born designer, Anita Dongre (so again, she’s throwing a spotlight on a lesser-known label) teamed with a pair of Mint Velvet wedges. And, yup, you guessed it, she totally ran around in those heels in 35 degree heat and 66% humidity. Who knew espadrilles were anyone’s sporting shoe of choice? 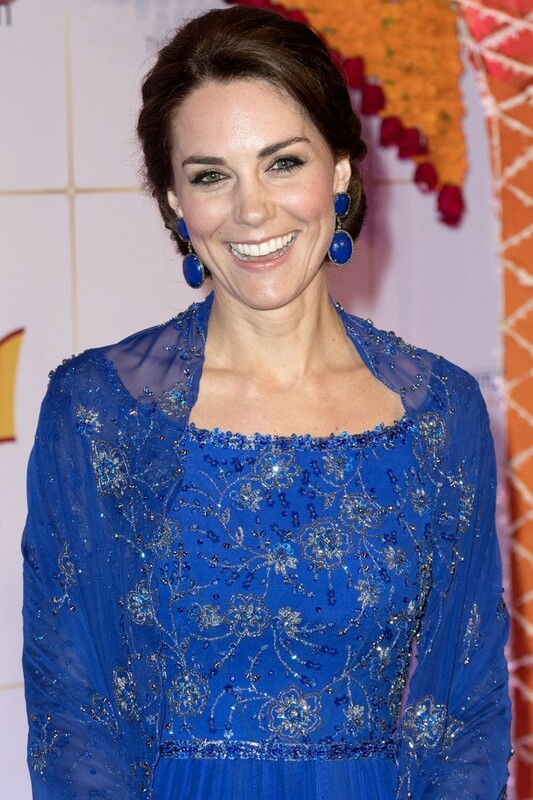 Later in the evening, Kate went for a decidedly Bollywood glam look, asking British designer Jenny Packham to whip up a sparkly cobalt number with a sari-like cut. She glammed it up even further with a pair of bold blue earrings by Jaipur-based jewellers Amrapali and took the shawl element off later for the royal gala. 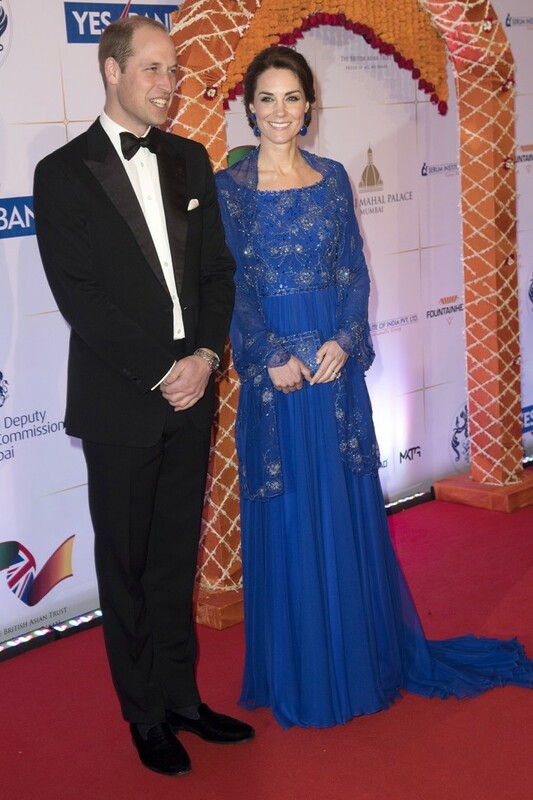 And for her next trick, Kate chose a cream wool day dress by London Fashion Week favourite Emilia Wickstead to meet with entrepreneurs in Mumbai. Priced at £1760, we assume Kate’s had a lighter version made for the scorching temperatures out there, but the biggest thing to note? She turned down a samosa because she didn’t want to spill it down that lovely fresh ivory. Well you would, wouldn’t you? Next on the agenda, William and Kate’s host nation threw a garden party to celebrate the Queen’s 90th birthday. 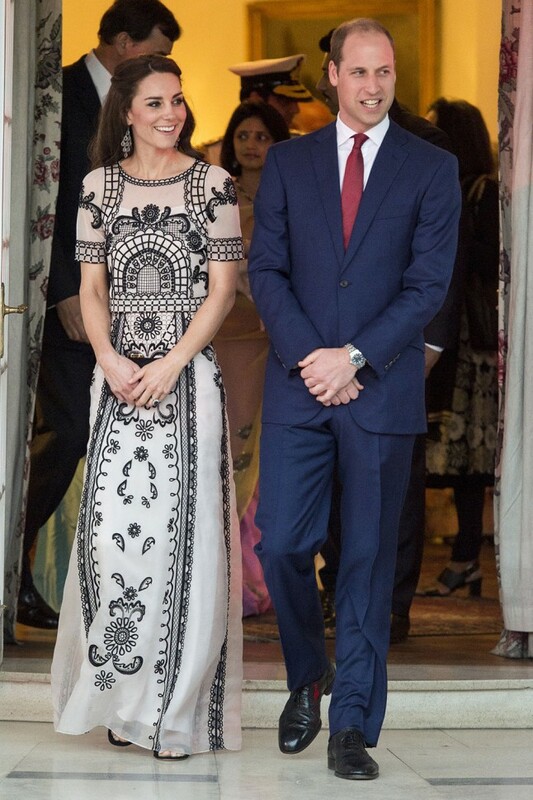 Kate chose a dress by another of her favourite fashion brands, Temperley London, this time sporting monochrome placement embroidery.